Choose a special way to express you feelings to a dear one. 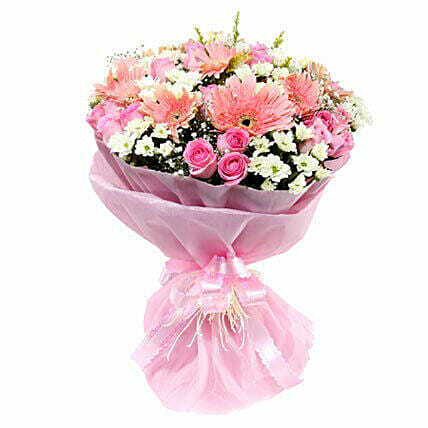 Send flowers with flawless blossoms to create a stunning pink beauty. Whatever the occasion, this flower bouquet of beautiful pink roses, gerberas and daisies, is sure to convey your message. A flower cannot bloom without sunshine, and a man cannot live without love. Max Muller Meaning of flowers: Pink roses are symbol of admiration and beauty, gerberas mean innocence and purity and daisies means purity and innocence.